I believe in the words of King Solomon, ”There is nothing new under the sun”;…but there are new interpretations of it. A native of Illinois, born in 1962, George’s love of glass started in the 1970’s when his parent’s owned an antique shop. The incredible works of Tiffany, Galle, Loetz and Stueben fascinated him. As a young man, George became friends with David Lotton of the highly acclaimed Lotton Art Glass studios. Watching a master craftsman creating Glass further fueled the fire within George to make his own designs. George began the process of experimenting and studying. He read every book on glass he could find. He created his first plunged flower design in 1988, a stunning paperweight of Calla lilies. As his confidence in his abilities grew he decided it was time to build his own studio. He loved the challenge of building his entire studio from scratch on his own. George also creates his glass alone which is unusual in this craft. Occasionally his wife Diane may help assist on a large piece when she isn’t busy caring for their two young boys. George has received recognition for his work from the National Paperweight Association. His glass has a traditional feel with the more modern vibrant colors of today. He believes in the words of King Solomon, ”There is nothing new under the sun”;…but there are new interpretations of it. 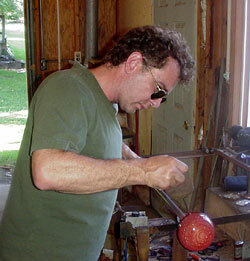 His work has been chosen by the Bergstrom-Mahler Paperweight Museum to be exhibited in their contemporary collection. George’s passion for his craft continues to grow everyday.